Lets get to know some of our favorite food bloggers a little bit better. Join us. Great fun! You'll never know who I'll interview next. 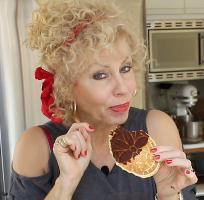 Today, we are chatting with Robin Daumit of The Food Fetish. What inspired you to start a blog and how long have you been blogging? I started my food blog, The Food Fetish, one year and a few months ago. I have been cooking since I could stand on a chair and knead bread. My passion for beauty, photography, and fabulous ethnic food, was the inspiration for wanting to archive my cooking whims in a place I could share it with family and friends. You was invited to the show Clash of the Grandmas, how exciting was that? Clash of the Grandmas. Wow! A sister poked me to enter. I did, and it was a crazy, fun, fabulous joy ride after that! In truth, I never went with the idea to win, but to experience the back stage making of films, visit my son (in LA), and bring a little exposure to my food blog. I love film making! What was your biggest failure in the kitchen? I don’t recall ever having a failure in the kitchen pertaining to food I cook, because plan B can often be as delicious as plan A. The only failure that does come to mind is that I did not teach one of my four children to cook. We are a large foodie family, with even a few professionals in the bunch, but I regret that I failed to insist that this particular child, embraced at least the basics of cooking. What is you favorite Mediterranean food? My favorite Mediterranean food? Hmmmm. There really isn’t one. The ingredients of the Mediterranean regions are what create the food and not the other way around. 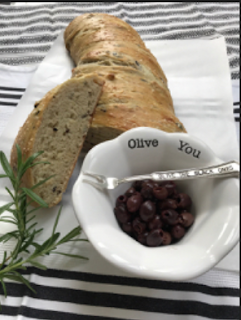 It is where flavors were born: Olives, figs, fire roasted foods, dried fruits, lamb, exotic spices. I just love them all, and the creative ways I play with them in the kitchen. Have you travel to other countries, if yes, where did you go and what was your favorite food? Travel. I have spent time in Italy, Greece, Portugal, the Caribbean, and lived in Brazil for several years. In all my travels, I have come to look at food as the language that everyone speaks. Chicken, fish, beef, tomatoes, dough, etc. are all ingredients every uses to cook with, but as I enter each kitchen, I feel enveloped into the ethnic pride and flavors of the person cooking it. In Italy, there is never a bad meal. Every meal felt like a special occasion, even if it was something simple. The flavors. The Italians understand flavors. In Greece, the lamb, and fish both cooked on open wood burning fire is spectacular. In Brazil the foods I enjoyed most where influenced by African cooking: exotic spices, coconut milk, simply, often poor people, who knew how to make food fit for a king. But when the topic is dessert, I still prefer the desserts made in Mediterranean countries because honey, nuts, and dried fruits make them not only delicious but healthy. What is your favorite recipe from your blog? It’s funny that you ask what is my favorite recipe from my blog, because every so often I just scroll through page after page and remember how I became all consumed with each idea I cooked, and all the hours, days and details that went into each one. I am biased, but in truth, each recipe is my favorite recipe. 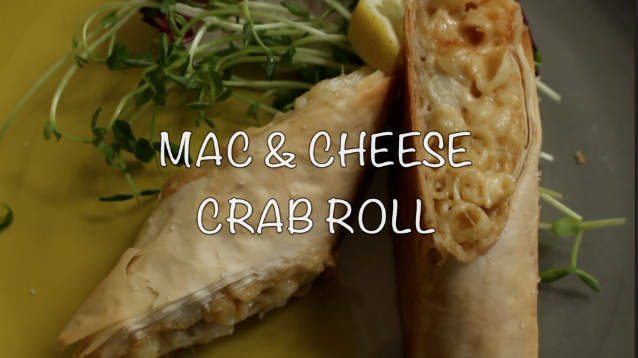 Mac and Cheese Crab Rolls, was something I had never thought to prepare in my life. But when standing in front of 30 cameras on Food Network, and the challenge was to prepare something with mac and cheese that could be a “to-go” dish, (like mac and cheese can even manage to go in the mouth without spilling everywhere, hah!) in an instant, I resorted to my roots of using phyllo dough, and being from the Chesapeake Bay area, crab seemed the likely ingredient to wow the judges. It did! They said it was sophisticated. So, in truth, each recipe has a story that went into the creating of it. Could you let us in on that food styling tip to get that perfect snapshot? Photography. Lighting, lighting, lighting! I use both still shots, lots of video shooting, and hours of editing. Thank you so much Christine for this very creative idea you are working on. Artists are what make this world beautiful!